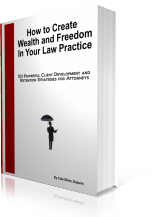 "How to Create Wealth and Freedom in your Law Practice, 101 Powerful Client Development & Retention Strategies for Attorneys"
Look around. No matter where you are in your legal career you’ll notice that the people that have the best life, and the most wealth, freedom and control are the rainmakers. While the Duchess of Windsor was right when she said: "You can never be too rich or too thin," she forgot one thing: "You can never have too many (profitable) clients." Rainmakers are the highest paid people in the firm. Not only do they make more money, but they look good, dress well, are members of private clubs, have extensive contacts, eat at great restaurants, have the largest house in the best neighborhoods, and most importantly, generally enjoy their practice more. No matter where you are in your legal career, if you have been looking for more money, more balance, more freedom and more control over your career, please let me help you. It sells for only $87.00. For less than what you charge for an hour of your time or a dinner out, I guarantee you'll be delighted with what you find! And if you allow me to help you, my fellow brethren, I'll even go so far as to say that in less than a year from now, you will be so thankful you did. "Cole educates the reader on what we are not taught in law school. His ideas are practical, fresh, insightful and powerful. Learn these simple tools and watch your law practice take off!!" So, who am I to make this assertion? Like you, I’m a lawyer and I have practiced in a variety of settings over the past 27 years. I’ve been an associate in a law firm, had my own firm, and worked in-house as General Counsel to various high growth companies. As a result, I’ve been both the "attorney" and the "client" and I’ve seen it all. I’m also a certified career and marketing consultant. I could tell you that I’m an author and speaker, closed millions of dollars worth of deals and yadda, yadda, yadda, but really "who cares". The only thing you need to know about me is that I’ve been where you are and understand how you feel. What I share with you comes from my own years of practice and experience. Having been on both sides of the attorney-client relationship, I completely understand what the client wants. I've hired lawyers from all over the world and have paid out millions of dollars in fees. I also started my own firm from scratch. As a result, I can offer a view point that few lawyers or marketing experts can convey. "I found it so riveting that I read it all in one-sitting, twice! When I started my legal career over 15 years ago, I embarked upon my profession like most - looking to do well in law school, pass the bar exam and "practice law". What I didn't know then was that to succeed in the practice of law and truly build wealth, one had to learn to become a "salesperson" first, and a lawyer second. No one has compiled such strong life lessons for attorneys as Mr. Silver has in this book. Mr. Silver is very knowledgeable and employs up-to-date strategies that work. If you are a lawyer, or thinking of becoming one this is required reading!!!" NOT JUST ANOTHER LEGAL MARKETING BOOK!! This book is really unique. It's not just another legal marketing book, but rather it guides you through a process that pinpoints you're uniqueness and addresses what YOU really want out of your legal career. It's based on the premise that when you do what you love, you become good at it. And when your "marketing" message and client development tactics are based on what feels comfortable within a "system" that's easy to implement, you are able to market your message and convey your offer with passion, meaning, and have fun doing it. In fact, I'm so positive that these ideas, strategies, and tactics will work for you that I'm offering a money back guarantee. You don't even have to believe me, because if I am wrong about any of this; it's irrelevant because my help is FREE! That's correct! I guarantee you'll double your revenues in less than 2 years or your money back, no questions asked. "Carefully researched and fast paced, this well written and highly enjoyable book represents a major contribution to wealth building for attorneys. If you want total control over your legal career, get this book, implement the tactics and watch your wealth take off!" Vedder, Price, Kaufman & Kammholz, P.C. "Cole's book is an unusual how-to guide because it is both entertaining and extremely useful. Even more remarkable, its advice about how lawyers can market their practices is useful for the junior associate, the senior partner and every lawyer in between. This book succeeds because Cole is your coach, your mentor, and your guide about how to achieve a more fulfilling life as a lawyer." The bottom line is that law, like accounting, medicine, engineering, or any other enterprise, is a business. And businesses exist to make money. In the legal profession, revenues are derived from clients. Preferably paying clients! If you're a law student, associate, in-house or even partner in a firm, in today's world you have to be a rainmaker if you want total control over your career. Even if you bill an outrageous amount of hours or become a national expert in your area of the law, these factors are no longer a guarantee of your financial and personal success. Even becoming a partner is no longer the Holy Grail it once was. Partners who have failed to maintain a steady supply of clients and bring increased revenues into the firm are no longer protected. New attorney designations, permanent staff lawyer positions and non-equity partner positions are on the rise, leaving lawyers with new titles but less firm ownership and power. Conclusion: There is only one thing that will guarantee your financial and professional success! And that's Marketing! It may be hard to believe that one little aspect of your business can change your life that much, but let me assure you that marketing boils down to one word. CONTROL! "It took me twenty years to build a self-sustaining, successful practice. If I had this book I would have done it in ten. Mr. Silver starts with the mental exercises and mindset changes necessary to turn a lawyer into a marketer and follows up with practical and proven strategies, tools, and tips. This is a must-read for any lawyer who is tired of carrying someone else's briefcase and hungry for the corner office." "As the managing partner of a litigation firm, I can attest to Cole's ideas and strategies. Cole has a distinct understanding of the true ideas and steps which need to be initiated by a successful practitioner in today's competitive environment. All of us will benefit from his guidance to continue to build our business." 101 Powerful Client Development and Retention Strategies for Attorneys sells for just $87.00, with 10% of the proceeds going to designated children's organizations. This is an electronic book only; meaning once you pay, you’ll have access to the book in PDF. If you prefer a hard copy, email me and I’ll tell you how to get it. What if you achieved all of the above? What will this year look like if you do it NOW? Really...What have you got to lose? How to make more money and have more freedom by developing a book of business that fits your professional goals. How to have a marketing system in place that helps you completely take control of your career. How to give up the pressure, fear, rejection and limiting beliefs that are holding you back from being a master rainmaker. How to love each day knowing that even if you’re downsized, fired or merged out of a job, you’ll have a book of business that will sustain and carry you into your next career move. How to be among the leaders in your firm and community recognized as a "go-to" person. How to diversify your client acquisition and retention efforts, whether it’s 50 clients with one technique or one client with multiple techniques. How to have new sources of clients and referral sources all the time with over 100 new ideas and strategies that fit your personality and life style. How to enjoy your practice more knowing you're doing something you enjoy for a group you care about. How to create a life with more balance and have the time to enjoy the things you want. How to be laser focused in all of your business development efforts. How to achieve security and protect the future of your family knowing that you can get and keep clients anytime you want. How to use universal laws to love what you’re doing by doing only what you want to do. How to create your unique professional legacy. How to stop wasting money on advertising and marketing promotions that are worthless. How to focus on cost effective client development methods that are proven to work. How to increase the quality of new clients and then keep them for life. Best of all, how to fire the ungrateful, unprofitable and annoying clients. How to increase the number of referrals from each client and from outside professionals. How to create additional revenue sources that can make you money while you sleep. How to discover the fastest, surest way to double your practice! These are just merely a few results you'll experience. Imagine holding a blueprint to your personal and professional success in your hands! book click here to download the pdf. If you ready to have the professional life you deserve, order your copy of the book today! 101 Powerful Client Development and Retention Strategies for Attorneys sells for just $87.00, with 10% of the proceeds going to one of the following children's organizations. I look forward to hearing from you very soon!